On February 23, Shanghai Zenith 2010 annual installation engineers' congress of commendation was held at the multi-purpose hall. All members of Group Management Committee, the heads of the marketing system, and hundreds of field engineers was present at the meeting. 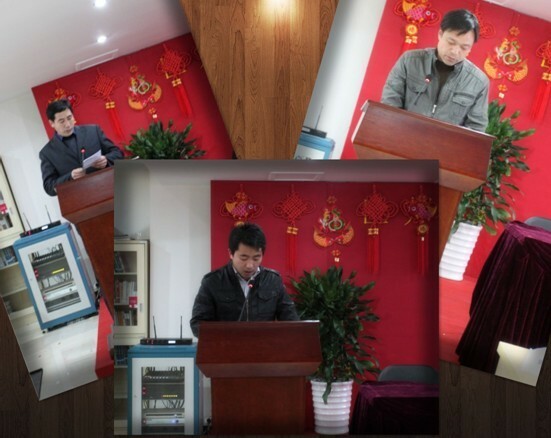 First, the Group Director of Operations Manager Liu confirmed the achievements of the team of Zenith engineers made in the year 2010, and expressed sincere thanks to their efforts to the company. During the past 1 year, hundreds of client service center' engineers had completed the installation of more than 2,000 domestic customers and nearly 300 foreign tasks; spontaneously seek nearly 1000 all types of customer demands, and contributed to sales of more than 20 million. At the same time, Ms. Liu pointed out that with the development of the company, the gradual enrichment of the talent and R & D technology, our engineers team should continue to play a backbone forces, and by the rapid development of the company, to obtain both the growth of income and personal achievements. Finally, Liu said that in the coming year the company will pay more attention to the engineer team and appointecompanyd several hopes of the company. Next, head of marketing system said that the future development of the Group has a long way to go, hoping they could work together with the engineer team to push the Group’s business into the greater glory. During the meeting, 10 engineers who did the most outstanding contribution in the 2010 were commended. Because more than half of the engineers were still performing the installation tasks abroad, six of them were awarded by the new employees instead. After hearing the care and protection of company' policy, engineers all expressed that they would learn from each other, work patient, further improve their technology expertise, and will work hard to the construction of the company's century-old heritage through genuine service.